We have built a display at Noisebridge inspired by projects such as [http://www.zuloark.com/muro-de-botellas/ Muro de botellas] or [http://matelight.rocks/ Mate Light]. 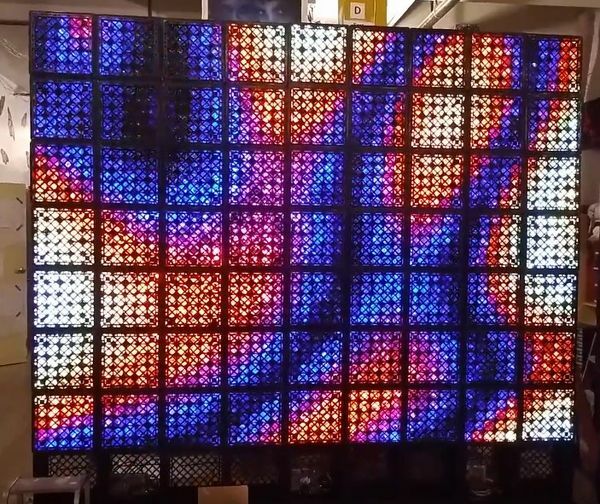 FlaschenTaschen is a 10’ by 9’ video display made out of clear glass bottles, milk crates, RGB LED strings (with a total of 1575 LEDs), and a controller board. Each bottle is capped with a single addressable RGB LED. 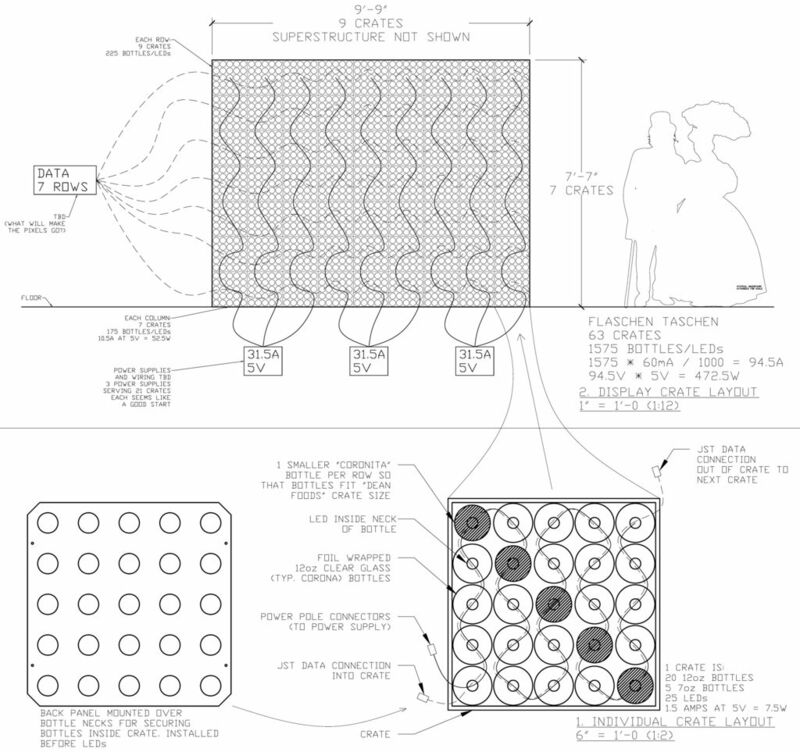 The bottoms of the bottles act as lenses for the emitted light. The project has a German name as homage to c-base’s [http://matelight.rocks/ Matelights] project. After seeing Matelights at Chaos Computer Congress, we were inspired to build a similar project at Noisebridge to present at the 2016 Maker Faire. Our goal was to have it completed for [http://makerfaire.com/bay-area/ Maker Faire 2016] to be shown as part of our booth and we were two weeks ahead of schedule. After the MakerFaire, the display will be permanently installed within Noisebridge and possibly rented out for events. This idea was inspired by the [http://www.c-base.org/ c-base] [https://github.com/jaseg/matelight matelight display] shown at the 32c3 and the 2015 Chaos Communication Camp. Our code and hardware that drives up to 16 LED strips from a Raspberry Pi is on [https://github.com/hzeller/flaschen-taschen Flaschen-Taschen github]. We are using 9 strips in this project, one for each crate column. Another inspirational build is the [http://www.zuloark.com/muro-de-botellas/ Muro de botellas] project. FlaschenTaschen is 9' 9" wide 7' 7" tall (about 3m x 2.3m) and host 1575 lights. See the drawings at the bottom of this page for the design. Our goal was to have it completed for [http://makerfaire.com/bay-area/ Maker Faire 2016] to be shown as part of our booth and we were two weeks ahead of schedule. After the MakerFaire, the display will be permanently installed within Noisebridge and possibly made available for events. Our code and hardware that drives up to 16 LED strips from a Raspberry Pi is on [https://github.com/hzeller/flaschen-taschen Flaschen-Taschen github]. We are only using 9 strips in this project, one for each crate column. The next hackathon to make content is on Sunday evening 2016-05-08. Check out this [https://docs.google.com/spreadsheets/d/1zdod43IjRIaBHS1P-Tu2uoYlBOLzDRJtwIGOXMmya3A/edit#gid=0 amazing matrix of beverages and sellers]! * We need a good amount of Coronita bottles. Costco should have Corona for <= $1 a bottle. FlaschenTaschen is a 10’ by 9’ video display made out of clear glass bottles, milk crates, RGB LED strings (with a total of 1575 LEDs), and a controller board. Each bottle is capped with a single addressable RGB LED. The bottoms of the bottles act as lenses for the emitted light. The project has a German name as homage to c-base’s Matelights project. After seeing Matelights at Chaos Computer Congress, we were inspired to build a similar project at Noisebridge to present at the 2016 Maker Faire. Our code and hardware that drives up to 16 LED strips from a Raspberry Pi is on Flaschen-Taschen github. We are only using 9 strips in this project, one for each crate column. 2016-04-22	Software and Electronics night! 2016-04-23	Crate build: Catch up day. 2016-05-19	Pre Maker Faire 5MoF? 2016-05-28 Begin Install of FlaschenTaschen crates at Noisebridge.